The Ciudad Perdida (Lost City) is one of the most challenging and rewarding treks we’ve ever been on. And if you’re anything like us, you’ll have a lot of questions when it comes to planning your jungle trekking adventure. There are many things to think about in terms of which company to go with, what to pack, where you’ll sleep, how difficult the trail is and what you can expect from this 4 – 5 day journey. 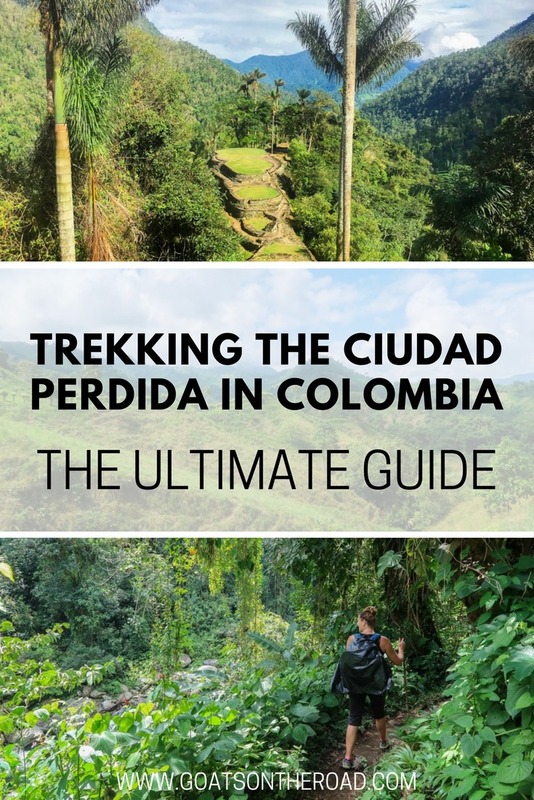 In this ultimate guide to trekking to the Ciudad Perdida in Colombia, I’m going to break down everything you need to know, based on our first hand experience. 3 days of hiking is worth it to reach these ancient ruins! 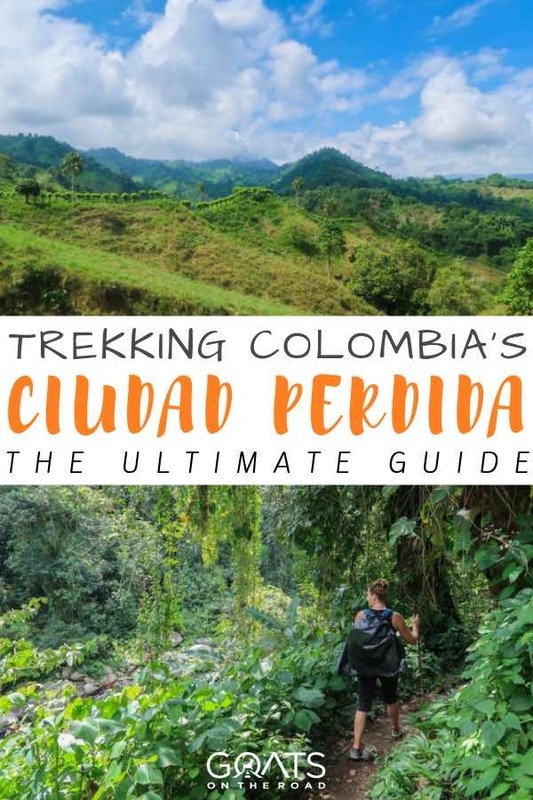 Who is the Ciudad Perdida Trek For? Am I capable of hiking 14 kilometers in a day? Can my body handle steep ascents and descents (ie: bad knees or back)? Do I mind sleeping in basic conditions out in the jungle? Am I able to cope with mud, rain, heat and bugs? 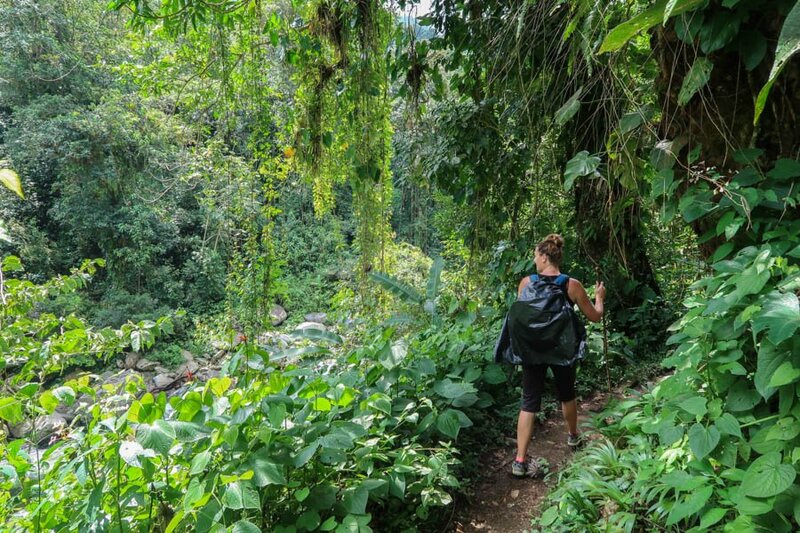 We believe that you need to have a decent fitness level in order to complete (and enjoy) the Ciudad Perdida trek. If you exercise regularly, you will be fine. Age doesn’t matter either as we had two 62 year olds in our hiking group. You will be able to hike at your own pace and there are numerous pit stops that are set along the way. You will want to make sure that you are up for the trek both physically and mentally, however, as there is no way to get a vehicle in to retrieve you and bring you out if necessary. You will have to hike, or take a horse. Having said all of this, don’t worry! This is a popular trail with numerous people of all ages and physical abilities completing it each day. We came across an older man with really bad knees who was struggling quite a bit, but he still completed the Ciudad Perdida trek. There were people of all fitness levels on the trail as well. We only met one woman who quit after the first day. 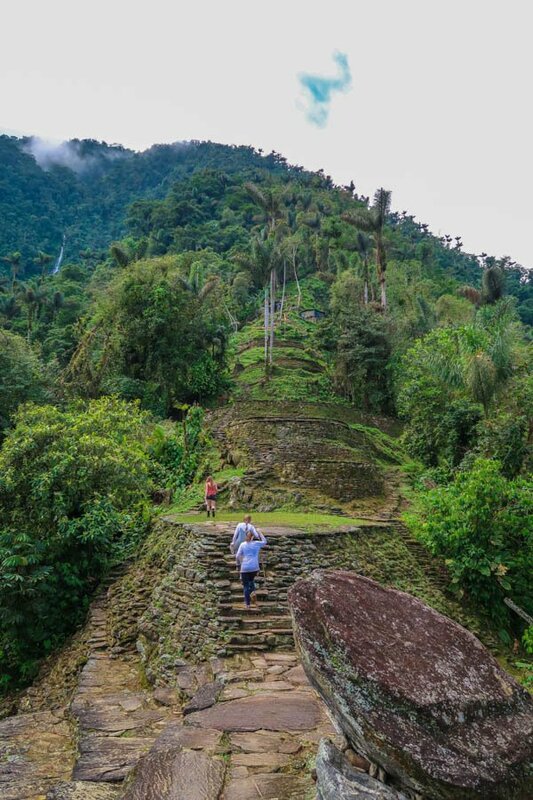 If you are in good health and want a challenging trek to some incredible ruins, we recommend hiking to the Ciudad Perdida, it’s one of the most amazing things do to in Colombia. 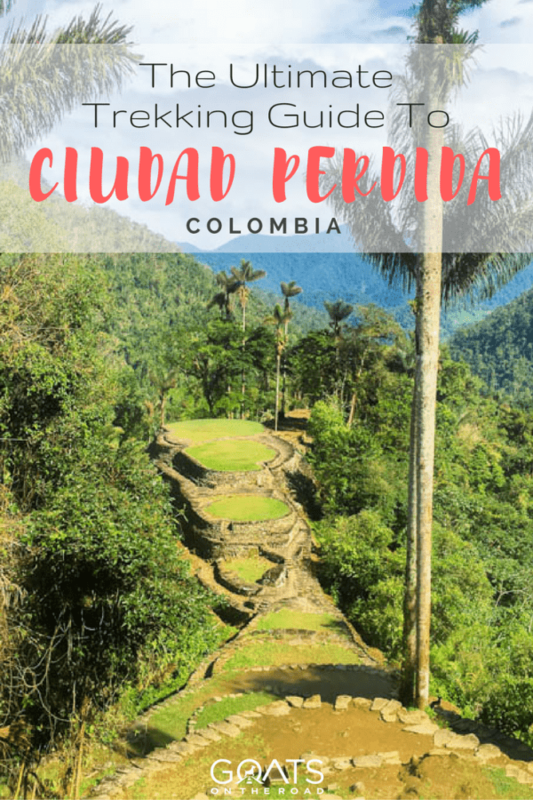 If you are in good health, and relatively fit, hiking the Ciudad Perdida won’t be a problem for you. 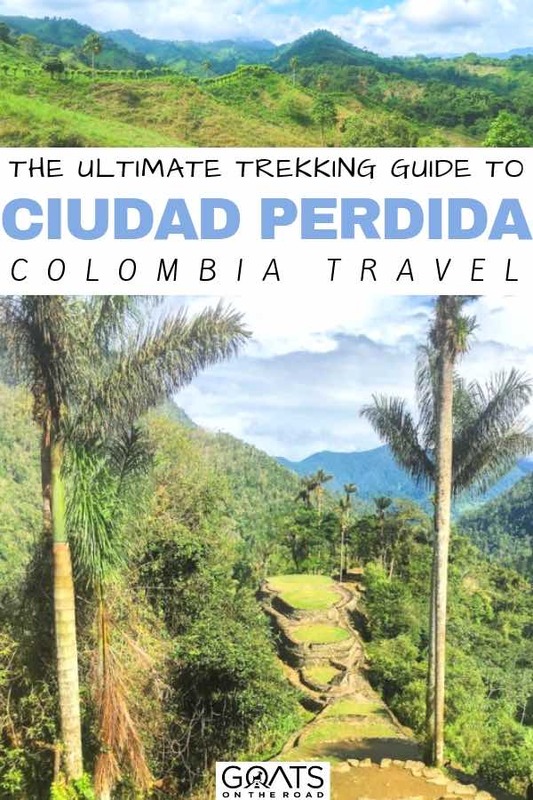 You can trek the Ciudad Perdida year-round. However, the dry season technically runs from December – March. During this time, there will be less rain, meaning that the Buritaca River will be much lower and easier to cross. This also means that it’s the high season so there will be more traffic on the trail. Other times of the year, you can expect rain in the form of torrential downpours, to light sprinkles, with water up to your chest during river crossings. It’s hot and humid in this jungle year-round, but in the evenings if it has been raining or if there is some wind, it can be cool. We trekked December 7th – 10th and we had torrential rains from 1:00pm into the night. In the mornings up until around 1:00pm, it was cloudy, or sunny without any rain. The groups of hikers were staggered in a way that we didn’t find the trail busy whatsoever, and often found ourselves blissfully alone in nature. The scenery on day 1 (which is the same as day 4), is stunning! 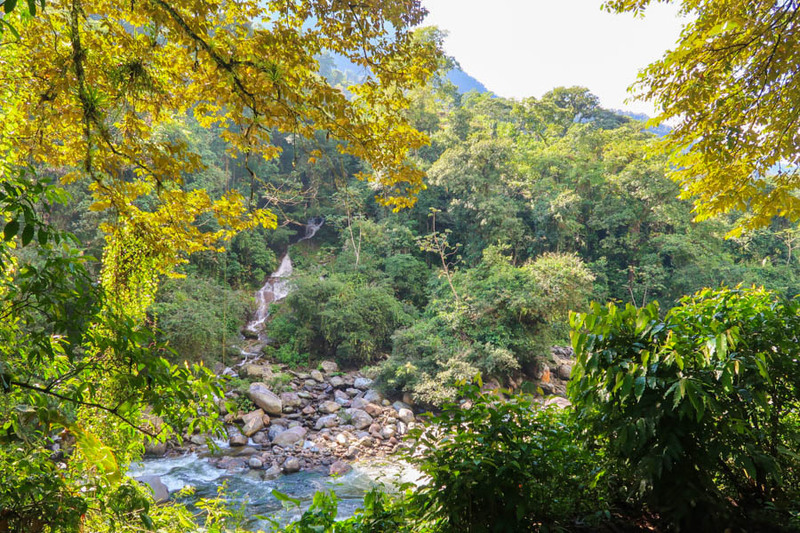 Once you’ve made the decision to trek to the Ciudad Perdida, you’ll need to book your tour. Everyone must join a tour, this isn’t a trek that you can do independently. Depending on your physical abilities, you will need to decide between a 4, 5 or 6 day trek. We did a 4 day hike, and that is the duration that most people go for. Regardless of which hike you choose, the cost is the same. 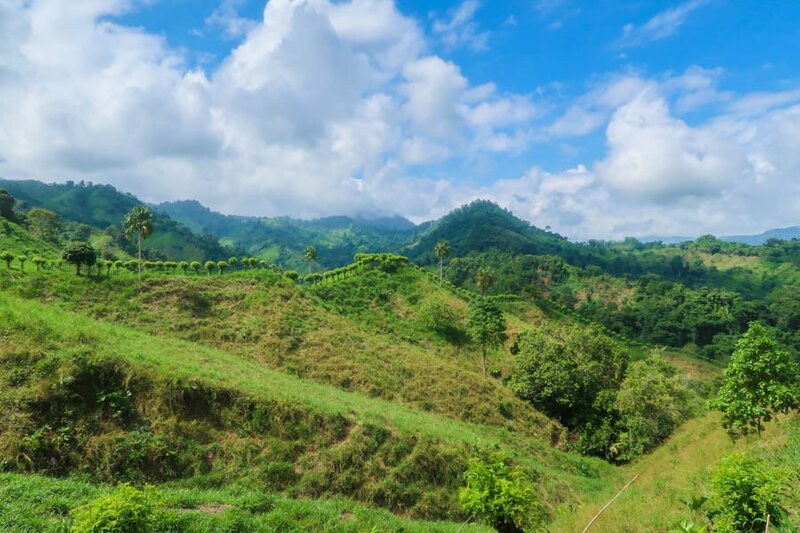 There are a few tour companies that run trips to the Ciudad Perdida and you’ll want to do your research before choosing an operator. Check websites like TripAdvisor.com, speak to travellers who have just completed the trek, or have a look at travel blogs online – like ours! After doing some research, we decided to book with Expotur in Santa Marta, and we had a very positive experience with them and our guide, Josa. Once you choose your tour operator, you will need to reserve your spot online. Expotur required a deposit of $50 USD / person to hold our place on the tour and we were able to pay this by PayPal. If you have set dates and you know exactly when you’ll be in Santa Marta, then book your tour right away to ensure you have a spot. Tours depart every day from Santa Marta. If you aren’t sure exactly when you’ll be in the area, it’s possible to book your tour closer to your arrival. We booked one week before we set off trekking. The cost of the trek with Expotur is currently 850,000 pesos, or $290 USD for a 4-6 day trek. This price has gone up in 2017, as it was 700,000 pesos when we went in December, 2016. According to information we received online and from our guide, the cost is supposed to be the same for all of the tour operators. There are many things to consider when picking your tour company, but if you’re a non-Spanish speaking person, the main thing to look out for is whether or not your guide speaks English (or your native tongue). We met quite a few groups at the Ciudad Perdida with guides who only spoke Spanish. The guide would explain the entire history and everything else that the hikers needed to know, but then there would be a translator who would have to say the entire speech all over again. Everything took double the time, and to be honest, many of the trekkers looked bored / annoyed by this process. Another thing to make sure is that the organization you choose gives back to the indigenous communities, and if you have any food requirements (vegetarian, allergies, etc. ), that those can be met. You will be in charge of carrying all of your belongings with you, so you’ll want to pack as little as possible, seriously! When it’s hot and humid and you’re hiking a steep ascent, you’ll want a minimal amount of weight in your pack. All you will need is a daypack (rucksack) for this trek. If you have a pack with a waist strap, that would be best, as long as it’s not a big bag. We trekked with our Osprey day packs that are removable from our Osprey Farpoint 55L bags. The day bag is about 15L and doesn’t have a waist strap. Another option by Osprey is the Talon 22, or the Kestrel 32 which is very comfortable, but is a bit bigger. Everything in your backpack should be lightweight and quick drying. Because the jungle is so humid, nothing dries overnight. In fact, our clothing actually felt wetter in the morning. We recommend lining your backpack with a big garbage bag and putting everything inside of it. Also, if you have a bag cover, that’s good, but it won’t keep your whole bag dry. Our guide handed out large garbage bags to attach to the outside of our backpacks as “capes”, and it actually helped to keep the rain off of our packs. Basically, the goal is to keep everything inside dry so that you have something comfortable to change into at night – otherwise you’ll be miserable. You’ll take a 2 hour jeep ride from the tour office in Santa Marta to the small village of El Mamey. This is where you’ll have lunch and a “meeting” with your guide about what to expect for the trek. The trekkers who have just completed the trail will be here as well, make sure to ask them for their wooden walking stick. You’ll need it. You’ll set off around 1:00pm. It’s quite the incline the first day with not much shade. There is a hut on the way with the option to purchase Gatorade or water. Further on, there is a pit-stop with watermelon for trekkers. Towards the end of day #1, you’ll arrive at the river. If it hasn’t been raining, you’ll be able to cross by hopping on the rocks. If it has been raining, you’ll have to do a fairly deep river crossing. If you’re staying at the camp on the other side of the river, you can use the bridge. If you aren’t, the owner will not let you use it. After the first crossing, there is another one a few minutes later, before arriving at your first camp. We stayed at Alfredo Camp, but there are a couple of other options. It depends on which ones your tour company has planned to stay at. Dinner is served around 6:00pm. We dined on fried whole fish with rice, plantain and juice. Bedtime after that in either a bunk bed or a hammock. Blankets and pillows are provided, as are mosquito nets. The second day begins with getting up around 5:00am for breakfast and preparing for the trek ahead. Breakfast consists of eggs, fruit, toast, coffee and hot chocolate. Around 6:30am, you’ll start trekking. Today is a long one! First you’ll hike for about an hour on a semi-incline, followed by an hour of hiking up a steep incline. After those 2 hours, you’ll have a break at one of the pit-stops for some fruit. You can purchase water here. From there, you’re on a descent for a couple of hours, passing by some beautiful landscapes and local Kogui village. Around 11:00 or so, you’ll arrive at your lunch spot – Mumake Camp. Here you’ll have a 2 hour break for swimming in the river, relaxing and having lunch. From lunch, you’ll carry on alongside the river, over a large suspension bridge, and continue ascending to “base camp”, or Paraiso Camp. This ascent is quite long, and tough. But, at the end of it is a pineapple pit stop! From there, you’ll have a couple of easy river crossings and beautiful scenery before arriving at Paraiso Camp at roughly 4:00pm. This camp is busy with lots of trekkers. Dinner is served around 6:00pm, consisting of chicken, rice and salad. We had a popcorn snack here as well! Today is the day you’ve been waiting for! 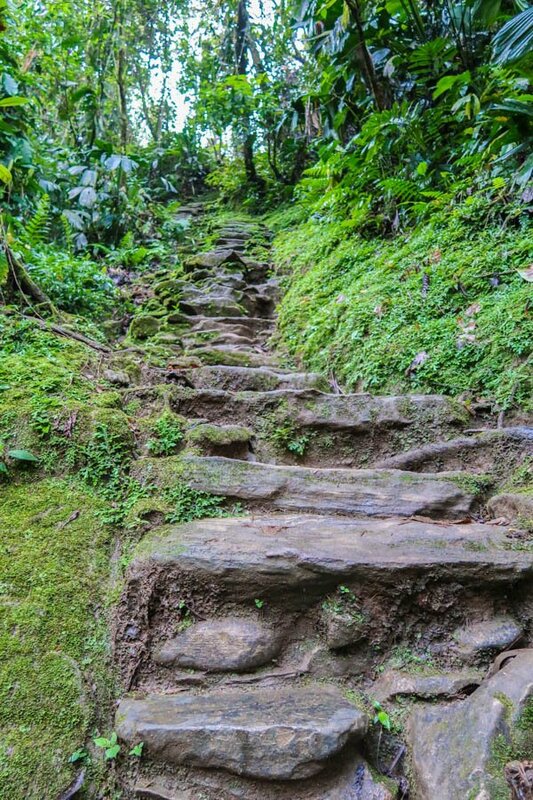 After waking up at the usual 5:00/ 5:30 time, you’ll start your trek to the Ciudad Perdida. It’s 1 kilometer and 1,200 stone steps before arriving at the ruins. 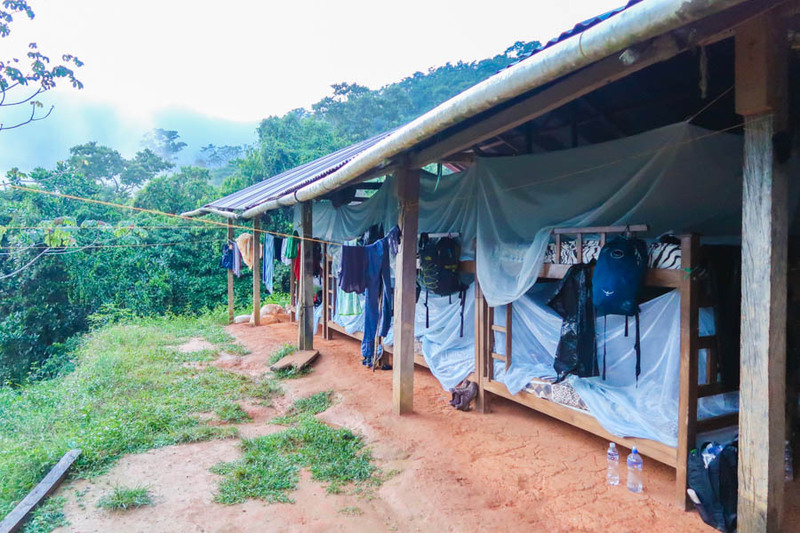 You are able to leave your backpack at the camp, as you will be returning here for lunch after exploring the Ciudad Perdida. You’ll wander around the site and learn about the history from your guide for a couple of hours. If you’re lucky, you might even get a snack up here. 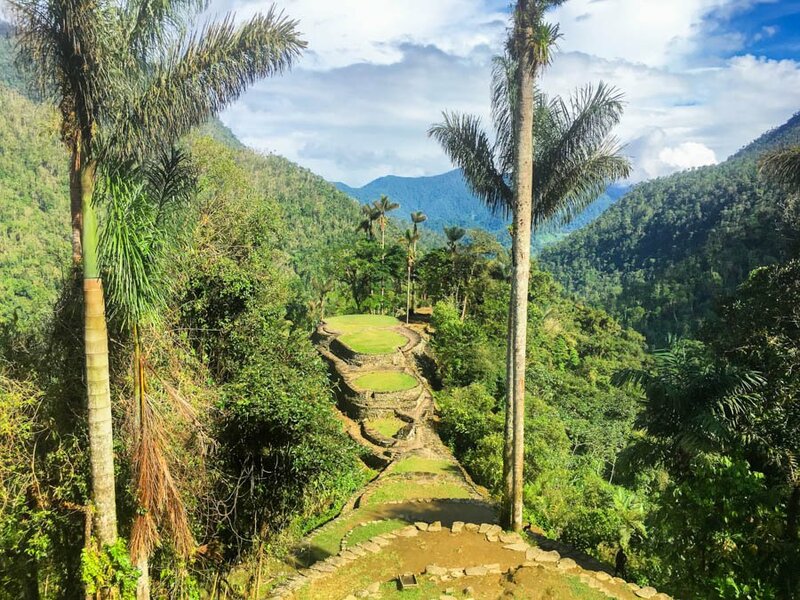 After enjoying the amazing Ciudad Perdida, you’ll descend back down the 1,200 steps – be careful as they are narrow, and slippery. Lunch is served at Paraiso Camp. You’ll continue hiking for another 7 kilometers back the way you came the day before. The trail isn’t a loop, and you have to backtrack in order to get out of the jungle. Most of the hike back to Mumake Camp (where you had lunch the day before) is downhill. If it’s raining, this will be incredibly slippery. There is no electricity at Mumake Camp, so you will be dining by candlelight. An interesting pasta concoction was served here, along with tea and hot chocolate. Today is the last day of hiking if you’re doing the 4 day trek. If you choose to do 5 days, you will spend one more night in the jungle on this day, breaking up the 14 kilometers. Start off the day with breakfast served by the incredible cooks at the camp (FYI, the cooks trek ahead of you in order to reach the camp before the hikers and prepare all of the food. They are so fast!). After breakfast, it’s time to trek back to El Mamey. There is no lunch available this time, just 1 break for some fruit. Today is a long, difficult day. You’ll hike 14 kilometers in about 7 hours (we were able to find some energy along the way and made it back in 5.5 hours.) There are some long ascents and even longer descents. If the sun is out, be prepared for no shade and make sure you have sunscreen on! 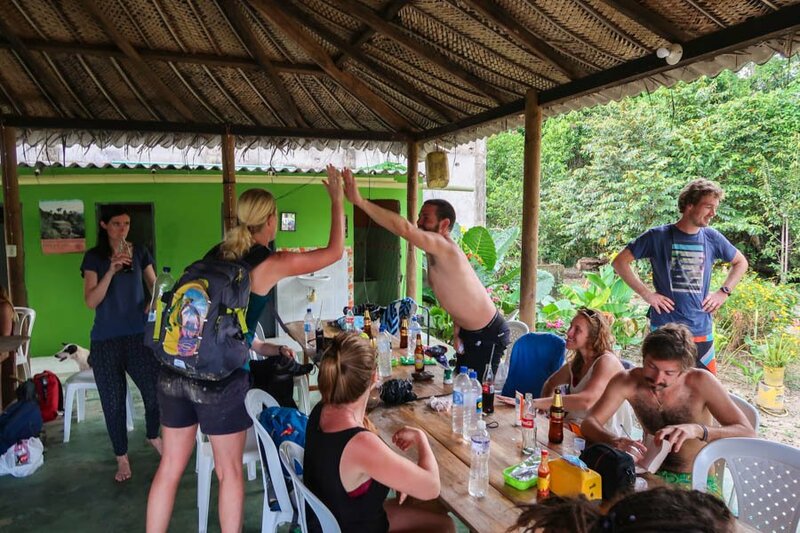 Arrive back at El Mamey for celebratory beers with your fellow trekkers, and enjoy a shower and lunch. Celebrating completing the trek is the best part! Your jeep will pick you up and take you back to Santa Marta, or if you’re continuing along the coast to Tayrona National Park, you can get dropped off there! If you’re wanting to go further along the coast, you can get dropped off at the junction to catch a bus to Palomino (for example). Make sure that you have a garbage bag lining your backpack. Pack pajamas for the evening. Make sure to have a wooden walking stick, or hiking poles – these are a must. Try to get a bed as opposed to a hammock, they’re actually quite comfortable. Get in the shower as soon as you arrive at camp, or you’ll have to wait in a big line! 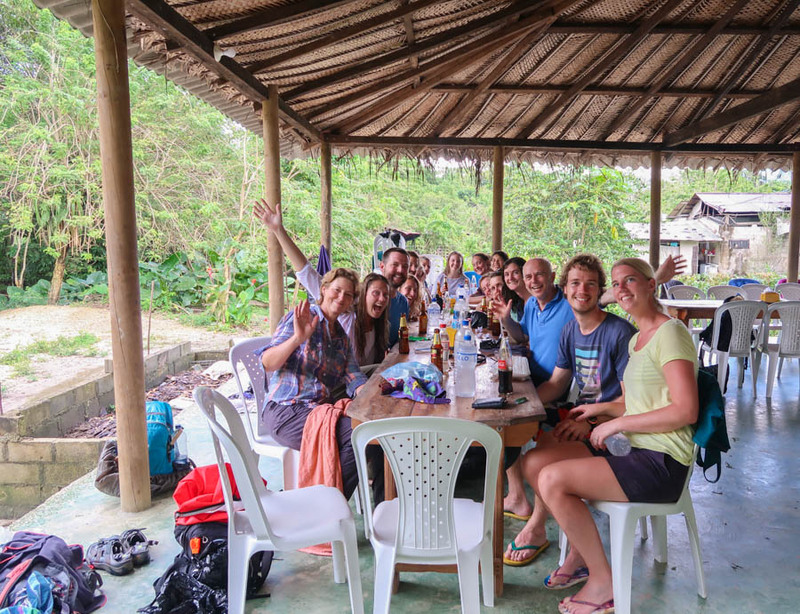 If you plan to move on to Tayrona National Park, or elsewhere, ask your tour company to bring your backpack from the tour office with the next group of trekkers. Because groups are going out every day, the jeeps will bring your backpack from Santa Marta to El Mamey for you to grab when you’re finished your trek. We did this and our driver even dropped off at the door to our accommodations in Tayrona National Park! 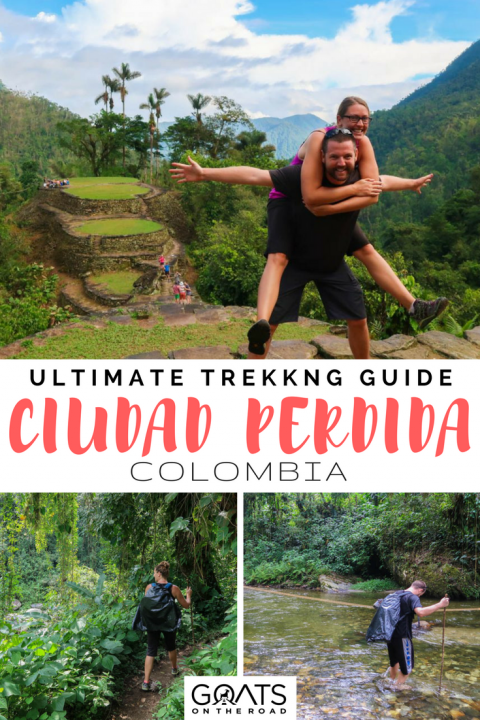 Check out our Videos to get a feel for what to expect on the Ciudad Perdida Trek! 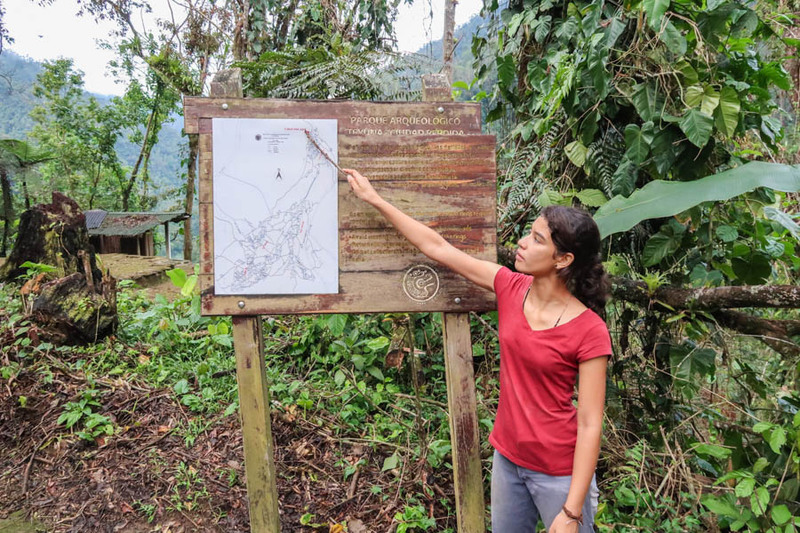 Wow, thanks Dariece for such a detailed overview of your Ciudad Perdida trekking! I’ve been itching to go there too! I’m not sure when that’ll happen, but I do feel more confident now knowing there are so many fun things to do out there. This is so helpful thank you! Do you have any advice on where to stay after the trek for some R&R?! This is really helpful. Thank you for all this information Dariece. I wonder if you requested a bilingual guide, and if yes, then how did you request it? They told me that they have Spanish guides and will have translator if you are more than 6 English-spoken people. Also, did you hear anything about the bedbug problem in the camps? Hi guys! Thank you very much for these videos about Ciudad Perdida. I did this trekking tour myself this year in August and it was truely amazing! You brought back so many wonderful memories of this tour. Muchas gracias. I was lucky enough to do the whole trek without any drop of rain!! But it was steaming hot instead. Thanks for commenting! I’m glad you had a great time and no rain…lucky! Thank you very much for this detailed article, super useful! I’ve been thinking about doing this trekking for years now and might go this year. However, I’m really looking for a 100% authentic experience and am more and more running away from touristic and commercial experiences to focus on nature connection and environment respectful expedition. Would you recommend this trekking as such?